Second reason for window tinting which is also quite common is that the tinting film makes the inside of your car cooler. In those warm summer days it does reduce heat generated by direct sunlight which will benefit the inside temperature of your car. 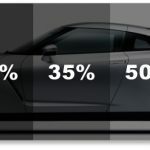 Low transparency window tint can reduce heat in your car by up to 70% which is absolutely something you should consider, but be sure to keep in mind the legally allowed tint in your state. Additionally you may even use less energy since your air conditioning won’t have to work so hard to keep your car cool. Direct sunlight can also damage the leather inside your car or at the very least discolor the interior so keep that in mind as well. 3. Blocks harmful UV rays. There’s also a health issue. It’s no secret that being directly exposed to sunlight isn’t a very good idea. A quality tinting film can block 99% of harmful ultraviolet rays and keep your skin protected while driving. Driving in direct sunlight can even expose you to sunburns so make sure you keep your sunglasses on and use window tint for protecting other parts of your body. Please call to set up your appointment and be sure to visit our website for several other car audio services offered. Longest on North Oak!